First of all we must establish that the mask technique is used by every mask in Commedia dell’Arte, consequently also the masks that don’t actually have a mask in their face. That is so all masks are playing in the same “world”, the same way, with the same energy and size. It does not work to have some masks (those without masks in their faces) act in another way then the rest. The mask also has the power to emphasize those who don’t wear a mask by the contrast between the stylized, static and the living face. 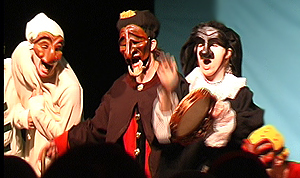 This demands off course that that the actors without masks act with the same energy and technique as those with a mask. One of the most important aspects of the mask technique is that the mask does not work in all angles. For example the audience will not be able to follow the masks emotions and intentions in profile as it don’t see the face of the mask. It depends on the fact that we can’t see the eyes of the mask when the mask is turned too much to a side. The static face of the masks also disappears when the mask is in profile. This is even more important as we are so much used to look at each other’s faces and communicate with our faces. See HERE. The mask is communicating with the audience almost only when it is turned to it, so that the audience can see the actors eyes and follow the reactions of the mask. Therefore does the mask turn to the audience every time it speaks, reacts or change emotional state. This obviously feels awkward for the actor, who is used to react in the direction of the stage or who he or she is talking to. This can also be quite difficult since the mask usually has rather small eyeholes and the sight is limited. 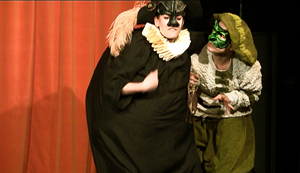 Since Commedia dell’Arte is played without a “4:th wall” this is perceived as quite natural for the audiences. Sometimes the audience doesn’t even notice the technique. This entry was posted in Acting style and tagged Arlecchino, blog, blogg, buffoon, buffoons, comedy, commedia, Commedia dell arte, fixed masks, jesters, Klingvall, Kompani Komedi, Kulturama, mask, mask teacher, mask technique, masks, Micke Klingvall, Pantalone, physical theatre, rite, rites, rituals, scandinavian theatre, Teaterstudion, theatre education, theatre school, theatre student, theatre teacher, vulgar, vulgar comedy. Bookmark the permalink.